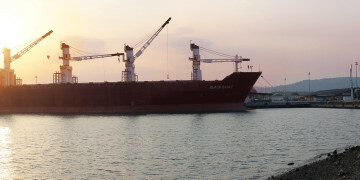 Consumer choices play a huge role in agricultural production. In Europe, many citizens see organic products as healthier and better for the environment. Because of large European opposition to conventional, industrial farming methods, organic production and retail markets are growing steadily every year. 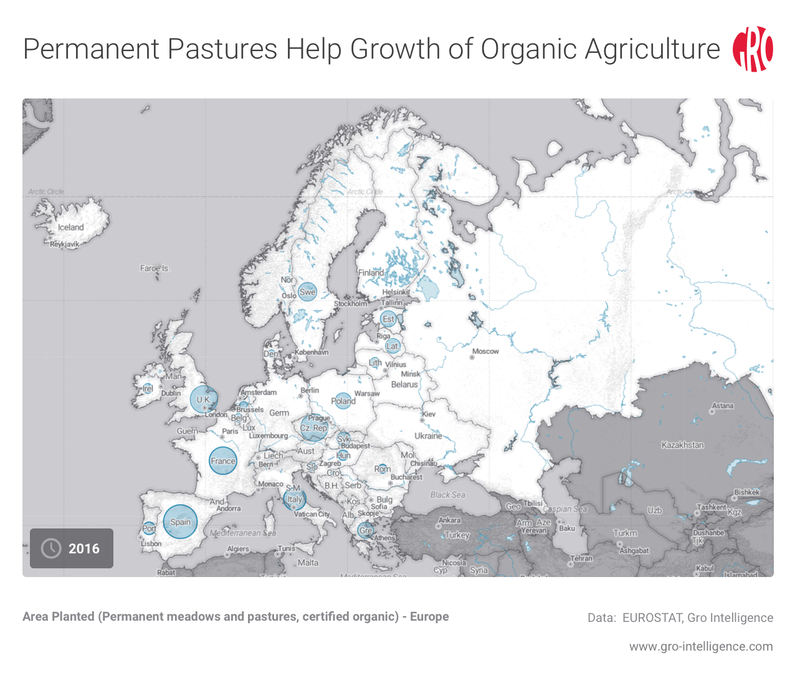 Organically-managed pasture land, used for livestock, represents a major component of Europe’s organic land area. Cereals like corn and wheat are showing major growth, along with perennial crops like olives and grapes that are used to produce organic olive oil and wine for consumers wishing to purchase specialty products. 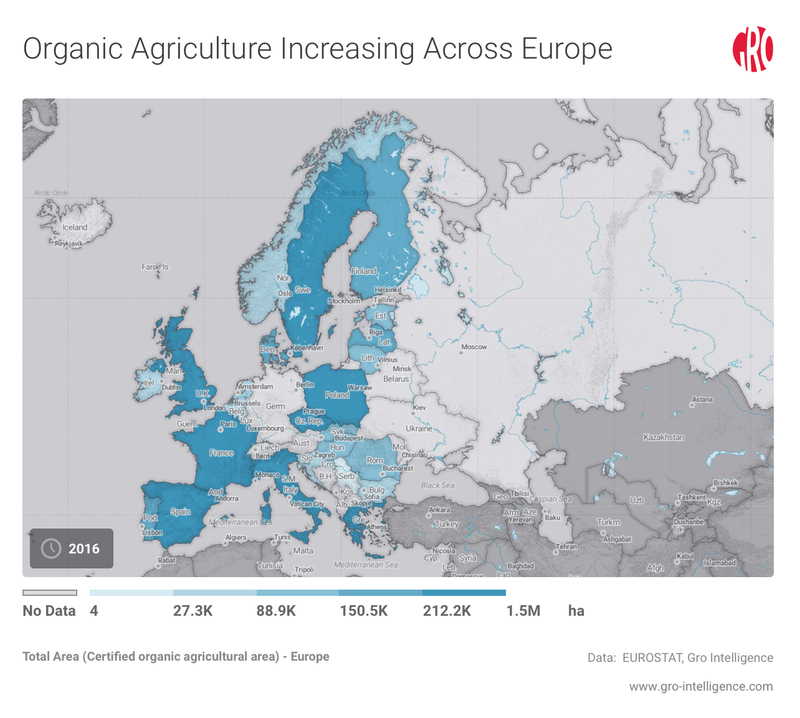 Although conventional agriculture still represents the majority of agricultural land and crop production, Europe’s organic sector is increasing rapidly with no signs of slowing down. Conventional versus organic agriculture has been a hot topic for many years. There are many proponents of each production method, all espousing reasons why conventional farming is better than organic, or vice versa. Many consumers and countries continue to oppose specific conventional farming practices such as the use of genetically-modified organisms (GMOs). GMOs are organisms that have had their DNA modified through the selection of desirable traits and the artificial insertion of those genes into plant cells. This gene tweaking goes beyond agriculture, as for many years scientists have modified bacteria to produce life-saving medicine such as insulin. GMO crops are widely used around the world to increase crop yields by helping combat agricultural pests and increase drought tolerance. And while these genetically engineered crops—mainly corn, soybeans, and cotton—are currently grown in 26 countries across 185 million hectares, production of GMOs is prohibited in 19 European Union (EU) countries. A clause in a 2015 EU regulation allows member-states to decide on the use of genetically-modified (GM) technology within their borders. Because the public commonly associates GMOs with conventional agricultural practices that debatably endanger human health and the environment, organic production is gaining a lot of ground across Europe. As of 2016, Europe is home to 12.1 million hectares of certified organic land, with 295,000 organic producers and 63,000 organic processors. Organic land across Europe doubled from 2006 to 2016, and currently accounts for approximately 6.7 percent of total agricultural area. The top organic-producing countries include Spain, Italy, France, and Germany. These nations account for 2.01 million, 1.79 million, 1.53 million, and 1.25 million hectares of certified organic land, respectively. 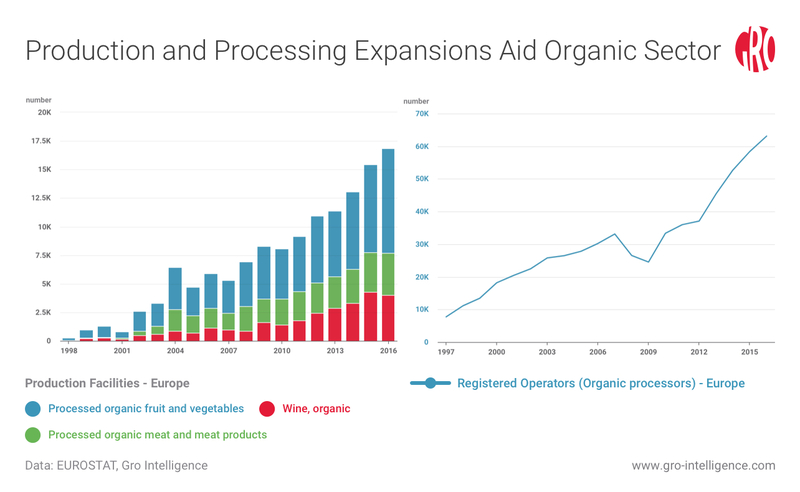 Organic sales in Europe reached 30.7 billion euros in 2016, with an average annual growth of 12 percent over the past decade. Top retail markets (all numbers from 2016) include Germany, France, Italy, and the United Kingdom (UK). Germany’s organic retail market has been experiencing an average 10 percent annual growth over the past decade, having brought in 9.47 million euros; France raked in 6.73 million euros and boasts average organic market growth of 22 percent per year. Italy’s organic retail market earned 2.64 million euros that year with annual growth averaging 14 percent, and the UK organic market displays a seven percent annual growth earning 2.46 million euros. Consumers in Europe are passionate about buying organic products, and the growing organic sector matches this demand by providing many ways to purchase goods. Organic goods are available to consumers in both the retail and foodservice industries, ranging from roadside farm stands and local markets to restaurants and supermarkets. Trust in organic products is high, with approximately 70 percent of Europeans trusting such products on the belief that organic farming methods address their animal welfare, environmental, and rural development concerns. Trust also stems from the EU’s strict organic regulations and labeling requirements. Compliance with these rules applies to every link in the supply chain, including farmers, processors, and traders of goods. Organic products must bear a label which provides more than just basic nutritional information, but also the producer, processor, and distributor company names. Europe’s agricultural economy is growing every year, bolstered by an increasingly diverse organic production industry. The cultivation of crops, orchards, and the production of livestock all play important roles in the organic sector. Permanent pasture, which is used for grazing livestock, currently represents about 58 percent of total organic land at 5.1 million hectares. Organically-managed permanent pasture area is highest in Spain, Germany, the UK, and the Czech Republic, with at least 400,000 hectares managed in each country. Pastures often require little maintenance, relying on grazing animals to preserve plant diversity and recycle nutrients back into the soil via manure. Pasture systems are also easier to convert to organic status compared to more intensive crop production because of the lack of inputs and maintenance necessary for pasture upkeep. Cereal crops—like barley, corn, and wheat—are currently grown on 1.6 million hectares across Europe, representing almost 20 percent of organic land area. The European top three producers, Germany, Italy, and Spain, currently sow approximately 200,000 hectares each. Although France grows slightly less than 200,000 hectares of organic cereal crops annually, the country produces the highest cereal volume in the region. 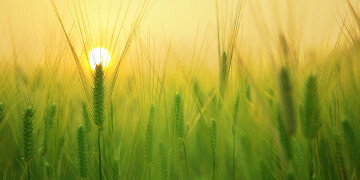 The difficulty of managing pests—mainly weeds—in the production of cereal crops limit widespread adoption of organics since the use of synthetic chemicals is prohibited under organic standards. 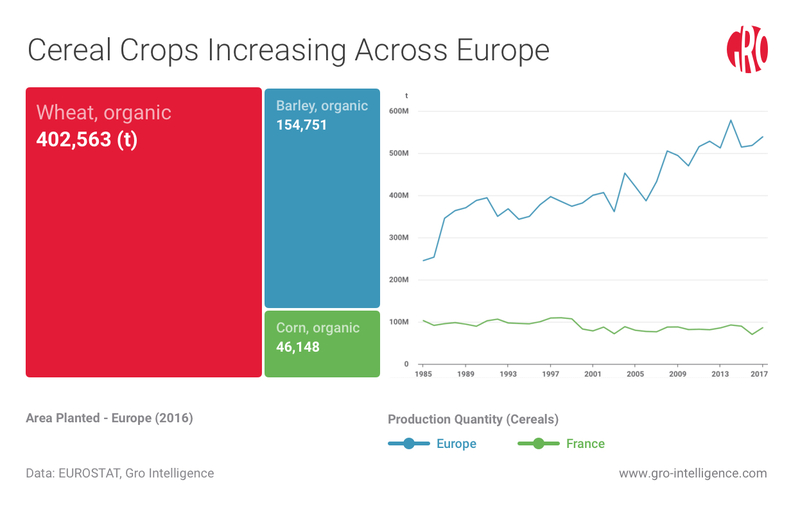 Nevertheless, organic cereal production is increasing across Europe as demand for products like organic corn and wheat grows. Perennial crops currently represent about 15 percent of the EU’s organic land area, with 1.3 million hectares in production. This category describes crops which have a growing period longer than one season, meaning they are not replanted after a single harvest. Examples of crops in this category are olives, grapes, nuts, and citrus fruits. 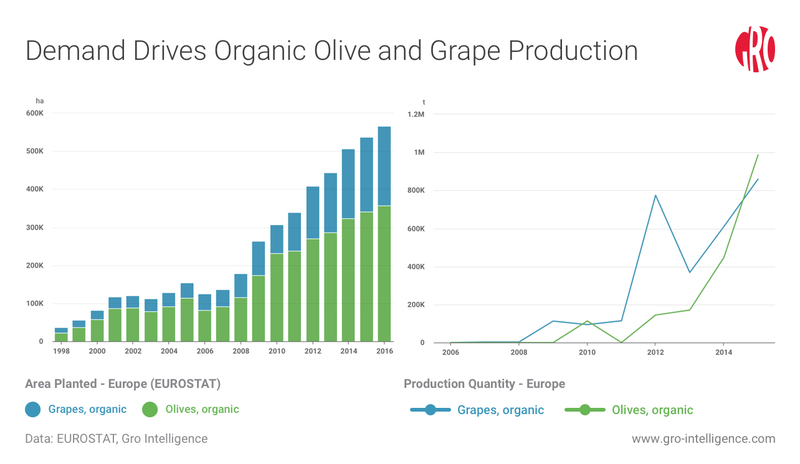 Olives and grapes are both highly important for Europe’s agricultural sector—olives are pressed into organic oil, and grapes fermented into organic wine, attracting local and global consumers who seek these specialty products. Organic olives currently represent around 34 percent of all organic perennial crop land, with almost 500,000 hectares in production. Spain, Italy, and Greece currently have the most land dedicated to organic olive groves, with 197,000; 179,000; and 47,000 hectares in production, respectively. Organic grapes are produced on 281,000 hectares total across Europe, representing 21 percent of total perennial organic crop land. Spain, Italy, and France currently cultivate the most organic grapes, with land dedicated increasing steadily over the past 10 years. Organic production is an increasingly important component of Europe’s agricultural sector. Land area classified as organic has grown substantially over the past decade as consumers look to purchase more organic produce, dairy products, meat, and specialty goods like olive oil and wine. The push for organic agriculture stems mainly from opposition to GMOs, as well as public concern for health and the environment. Member-states of the EU can now individually decide to opt out of GMO cultivation, with many choosing to do so. 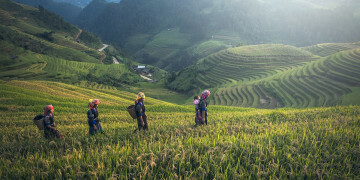 The European Commission (EC) has implemented an action plan which aims to analyze organic policy and increase the adoption of organic farming by better informing farmers of such policies and initiatives. The plan also looks to increase organic farming research and implement the integration of organic food in schools. In Denmark, the Organic Action Plan was started in 2015, with the Danish government investing 147 million euros to help farmers transition to organic production. The plan has a few priorities, including doubling the country’s organic land area by 2020, increasing organic product sales, and supporting higher use of organic food in public kitchens. Based on programs like these and changing consumer preferences, organic agriculture in Europe will surely continue its steep climb.